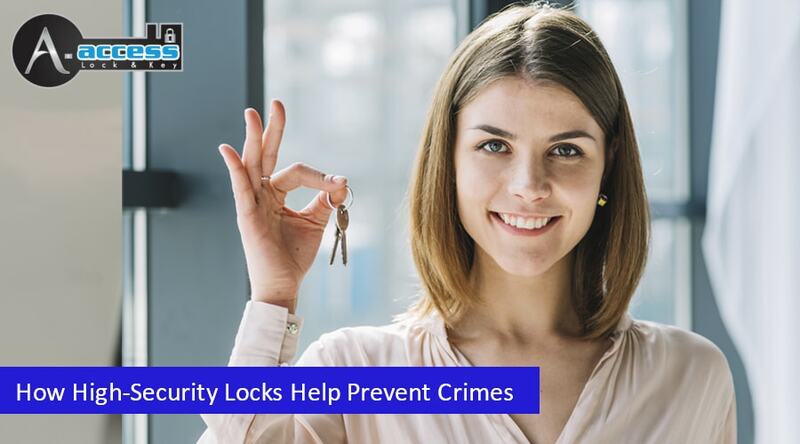 Our A-Access Lock & Key Certified Locksmith in Charlotte talks about how high-security locks can prevent all manner of crimes and stop burglars in their tracks. When it comes to your security, you should not be contented with using regular locks for your residential or commercial buildings. Bad guys these days are also going modern when it comes to forcing their way into homes or offices. However, you should know that there is an affordable yet effective solution to this problem: High-security locks. Let us see how high-security locks help prevent crimes. First, a bit of background. As per the industry’s definition, high-security locks use a cylinder design that provides more resistance to picking, impressioning, bumping, drilling, key duplication, and other forceful methods of entry. An unfortunate fact is that it is so easy for people to execute key bumping moves because of their availability online. What’s worse is that anyone can break into your home, car, or office because there are a lot of bump keys that can be bought online for as low as $30. These are the kinds of keys that do not leave any evidence behind. The best way to prevent this is to enable high-security locks to protect you. Another crime that should be prevented with the use of high-end locks is unauthorized duplication. There are thousands of key duplication services all over the country, from hardware stores and malls to locksmith shops. If you don’t use a key control system, you won’t have complete control over how many people could possibly have keys to your locks. High-security locks are the solution you’re looking for. Forced entry, also known as breaking and entering (B&E) is another crime that can be prevented with the help of these locks. Thieves usually break into homes or buildings by prying the door or forcing it open. Some even hammer, drill, saw, or wrench it. These home intruders will be stopped dead in their tracks thanks to your high-security locks. To prevent all these problems and more, you can always use a Mul-T-Lock cylinder. They are almost impossible to pick or bump. It uses two unique locking mechanisms that can be opened by a custom Mul-T-Lock key. The Mul-T-Lock system provides complete key control. It comes with an ID card with your initial order. If you ever need more keys in the future, it will be monitored under your stored personal information and you will be given the keys if you show the ID card. This ensures that you will have peace of mind knowing that they cannot be opened by just anyone. It is a good thing that you can Mul-T-Lock cylinders that can weather any of these attacks. They have a deadbolt that is considered the highest grade lock in the market today, the highest quality among all high-security locks. Switch to high-security locks from Mul-T-Lock for a safe and secure home or office. How does one obtain high-security locks? High-security locks are affordable and widely available in the market today. These are more than enough to boost the security of your residence or business. If you need high-security locks, A-Access Lock & Key can give you the Mul-T-Lock that you are looking for. Our High-Security Locksmith in Charlotte NC is extremely knowledgeable and well-equipped to deal with any issues. Aside from installing fresh high-security locks, our team of technicians provides great customer service, as proven by our Angie’s List 2013 Super Service Award and an A+ rating from the BBB. All our services are also licensed, bonded, and insured. You can call 704-545-5410 for our mobile locksmith services. Whether you’re at home or the office, we can reach you. Make sure to call us between Monday and Friday, from 8 AM to 6 PM and on Saturday from 9 AM to 3 PM. Our full timings are available in the sidebar on the right. Our team of professionals can set up high-security locks in your home or office to prevent crimes and keep you safe. Choose A-Access Lock & Key. We are the key to your security! Your high-security! Wherever you are in Charlotte, call us at 704-545-5410 and we will be there in a flash! Our Expert Locksmith can install Hgh-Security locks for you!